On Saturday, for the first time, it was clear enough that we could see Mt. 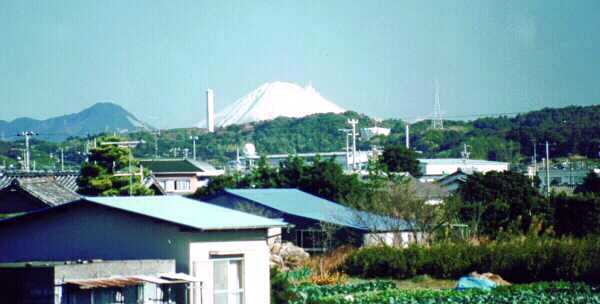 Fuji from our house. It does look majestic as it rises above the hills that are close to us. We could even make out the snow-covered sections. We think that in the past we may have mistaken the snowy patches for clouds in the sky. 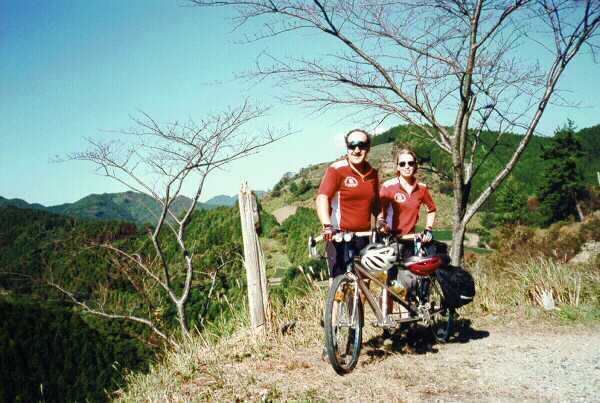 Yesterday we did what may have been our most challenging ride ever, definitely our toughest ride in Japan! We rode to the top of Mt. 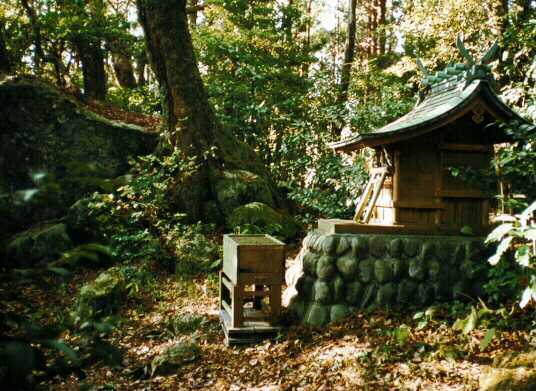 Awagatake. It's only 532 meters high (1745 feet) but steep at the top, and we started at sea level. We went north east from our house for about 20 kilometers on relatively flat roads. Then we hit the slight incline up for the next 7 kilometers. Then the hill began! We were in the 20 x 32 loooow gear for most of the next 9 kilometers. It took us an hour and a half to get up those last 9K to the top. Of course that included the obligatory stops for photo opps (translation: rest breaks). The views on the ride up were spectacular. This narrow, one lane road (with two way traffic) wound its way around and up the side of the mountain providing great views back down into the plains below, and even more beautiful, the local valleys on the slope. These farmers must be very determined. 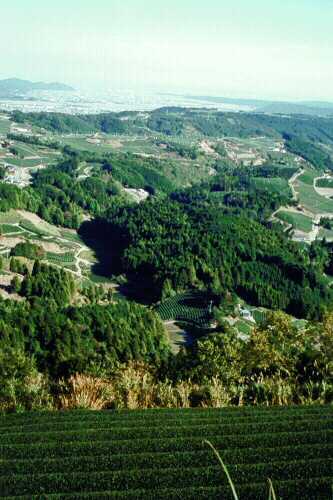 They are raising tea plants on slopes of 60 - 70 degrees! 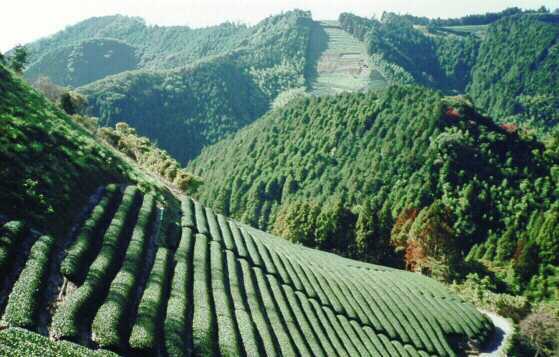 They have terraced them so that there is one row of tea bushes per terrace. The harvesting and tending of these farms must be extremely strenuous. 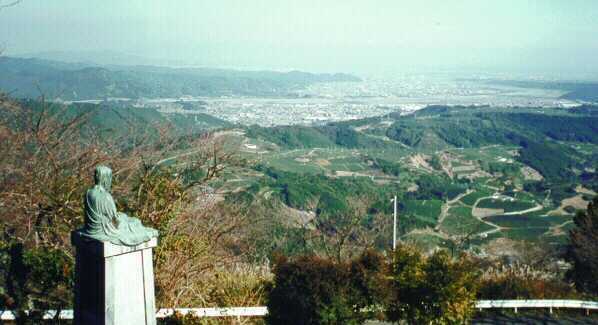 As we would look up the hillside above us we would occasionally see a guardrail or a glimpse of a road. The usual remark would be `Oh S***, we have to go up there!` At the overlooks we would peer down and go `Wow, we came from down there!` They were both overwhelming feelings, one a sense of the impossible, the other of immense accomplishment. At the second of the three stops we took, there were three Japanese who had picnicked at this overlook. They offered us tea and figs. We showed them our `sports drink` and politely refused. They took our pictures for us with our camera, and then they took turns having their pictures taken with the tandem and us. I hope our pictures, with the valley in the background, come out. About 1K from the top was a sharp switchback with a `traffic jam` as one car was going up and another coming down. We had to stop while they maneuvered around each other. Starting up the switchback was tough. In the lowest gear, when we tried to start, we would just spin the tire. And this was on a paved road. We ended up having to start 3 or 4 gears up and then quickly downshift so we could keep pedaling. The road was too narrow for two cars to pass each other, but every couple of hundred meters there was an extra half lane to be used as a passing area. We really hoped we would not have to stop again. The loss of momentum and the difficulty getting started were not things we wanted to experience again at this point. Fortunately we made it to the lower parking lot (about 200 meters from the top) without stopping. At this point there was a group from a high school track team standing in the road. As we crawled up to them we said (yelled) excuse me (sumimasen) and they barely got out of our way in time. Then three of them stated running up the hill and passed us giggling. Halfway up they ran out of steam and stopped! We kept chugging away, passed them again, and made it to the top. What a view! We could see all the way to ocean, I think in two directions. The plains near the ocean are soooo flat, especially compared to what we just climbed! We had lunch at the top. There was a snack shop and gift shop. We walked around the top area, visited the temple, hiked to the actual summit post and then headed back. We wore windbreaker jackets on the way down. The trip down was made for drum brakes. It was the first time I really would have appreciated having the drum brake control on a shift lever, since it was on full strength for about 6 of the 9 kilometers down. We also used a lot of rim brakes to slow for the sharp corners. The switchback that we had to stop for on the way up also made us stop on the way down, but for a different reason. I didn't think I could steer the tandem through such a sharp corner with the bank of the turn and the inevitable dip in the pavement on the inside of the corner. We stopped, Lindy stayed clipped in and while straddling the top tube, walked the tandem around the corner using the brakes to keep it under control. What a photo opportunity for someone else, but no one was there to see. The trip down afforded many more views of the valley, though I couldn't look since I was so concerned with where we were going. Ah, the stoker's life must be bliss! It's amazing how much more time there is to look when going up at 6 - 8 kph vs. going down at 20 - 30 kph. As I said, lots of brakes on the way down. We could have gone faster from a bike standpoint but, since the road is only one lane wide with mirrors at the corners to see ahead, I felt a little (a lot) prudence was in order. I don't think we show up very well in those mirrors, especially since the drivers are looking for cars, and are definitely not expecting a bike. It took us 3 1/2 hours to get to the top from home, and we were in the shower less than two hours after we left the top. We were definitely beat by the time we got home. Lindy turned into a couch potato for the evening, grunting every time she moved. However, we biked into work this morning with no ill effects. She said she felt good, but also said that if I asked for a sprint, to make a light, not to expect much. We would definitely do this ride again. It was probably the most picturesque ride we have been on. Difficult (muzukashii desu) but worth it! Rod and Laura, how about sometime in the spring when you come down from Tokyo to visit? The cherry trees are supposed to be in full bloom in April.